The knight covered in plate and mail armor has served as a shining example of chivalry ever since they first appeared on the field of battle. Noble in appearance and setting an example of justice the armored knight represents the very idea of good leadership in society. Being the popular subject of an endless list of books and movies as well, only adds to their aura. 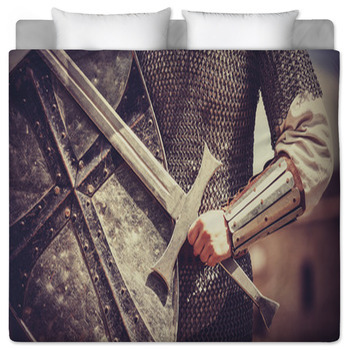 With knight bedding from VisionBedding the endless appeal of the armored knight can be brought to custom personalized bedding. The hardened knight was the great star of his day with a suit of armor custom built to fit him perfectly. 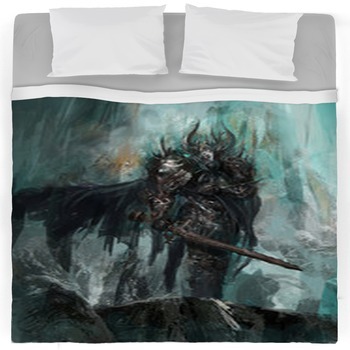 With over 500 unique knight bedding designs there is sure to be a design to fit every room just as well. 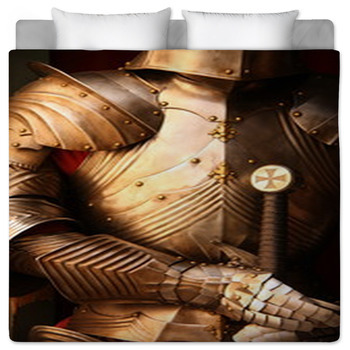 A bronze statue in a suit of plate armor who is standing tall while he holds his sword and shield, makes for a noble bedspread design. 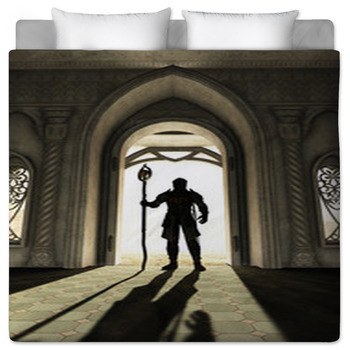 While a comforter design featuring a knight with his sword resting on his shoulders makes for a unique theme any guy would be glad to have on his bed. Adding a custom bedspread to any room brings a personal feel that gives a room a distinct character not found anywhere else. A knights home is his castle. And the castle represents a style in itself. A duvet design with a castle of white brick and tall towers amongst a perfect landscape is a great way to set a room apart from any other. 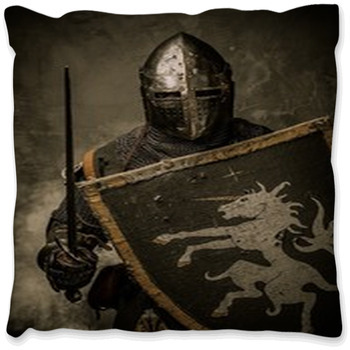 An iron shield design showing strong lions and golden crosses brings a feeling of strength to a knight bedding design any teenager will enjoy. 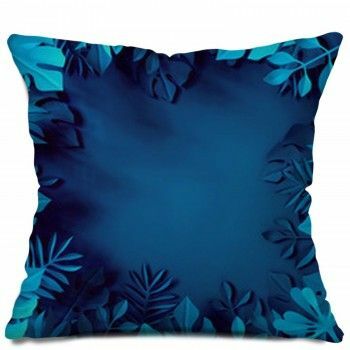 A custom bedspread can be just the beginning. 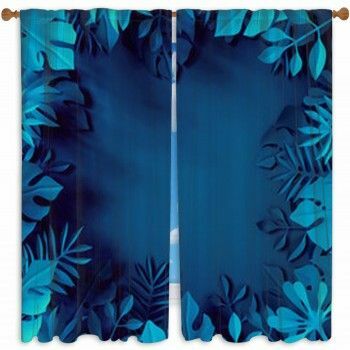 An entire room can be carefully brought together using any theme. 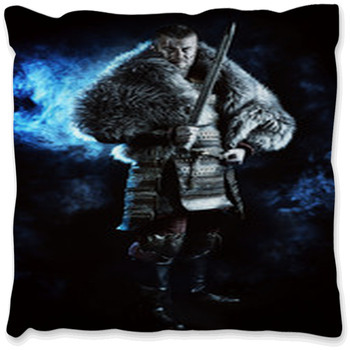 While bedding begins the theme process it can be completed with knight themed pillows as well as bed sheets and rugs. 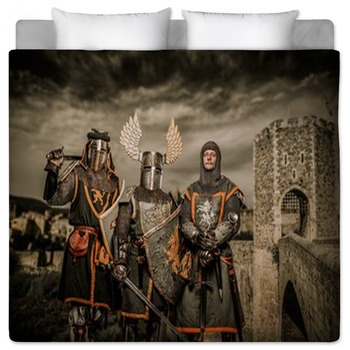 Unique knight bedding isn't just for teens and adults. Kids love knights too. 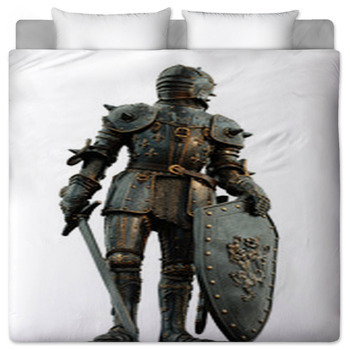 For a personalized bedding design any little boy would love to have on their bed nothing is better than a knight. 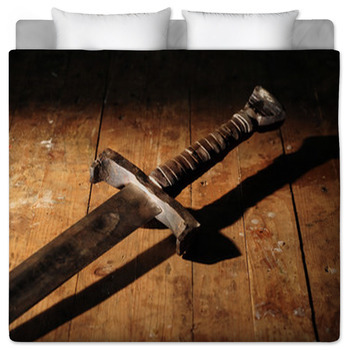 Standing strong with not just his sword, but his cape and crown as well, this bedding design is fit for any kids room. 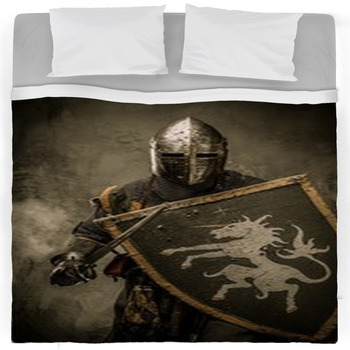 A cartoon image of a knight is bound to make any boy happy with his custom bedspread. Adding a custom comforter is a great way to bring personal sense of style to any room and always makes bed time easier with little kids.